Imagine having a wardrobe that you love, filled with pieces selected just for you in a city that has so much variety, there is something for everyone and not to mention the most sought out designers and boutiques. Why not step into 2019 looking stylish and chic? 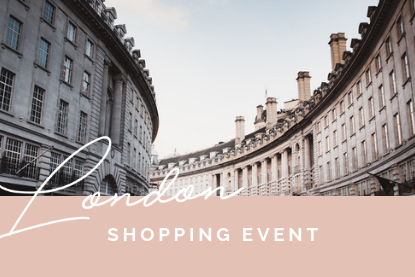 I have organized an exclusive shopping trip to London for a small group of ladies. Offering a bespoke service – designed to meet your individual needs so you can have the perfect spring summer 2019 wardrobe and feel amazing. You will arrive in London and you will walk into a private dressing room with gorgeous options waiting for you. Before you arrive, I will have already preselected pieces and combinations perfect for you. I will fetch anything else you need whilst you enjoy the experience with a glass of bubbly. The Investment 1,200 CHF till 31st December 2018 (special early bird rate). From January 1st 2019 the price will be 1,500 CHF. Spaces are limited, so register your interest today to be part of this very special event. The cost for two: 995 CHF each till 31st December, so why not bring a friend and make a weekend of it? The date to put in your diary: Saturday 2nd March 2019.